I celebrated a birthday earlier this week and I’m grateful. Although every moment, minute and day provide us with an opportunity for a fresh start, each “trip around the sun” is a good time to acknowledge and appreciate that we’re still here. We all have our share of problems and it often takes a tragedy, whether we experience it ourselves or witness someone else’s suffering or misfortune, to take stock of what we have and refocus on what’s important. For those of you who follow fashion and fashion bloggers, you may have heard of Kyrzayda Rodriguez. Kyrzayda was a fashion influencer who inspired many with her amazing sense of style. And based on all of the wonderful things I have been reading about her, she was equally kind and giving as she was fashionable. Kyrzayda recently passed away at a young 40 years old after a battle with stomach cancer, and she leaves behind a phenomenal legacy. You can read more about her here and here. Kyrzayda first popped up on my radar a few years ago and she was definitely one of my fashion favorites. Beautiful, stylish, shapely, with gorgeous hair - she seemed to have it all. 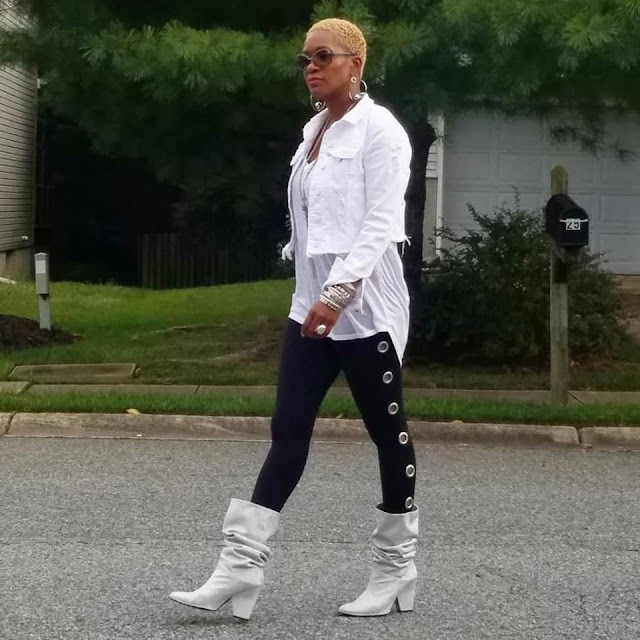 Over the past months you could see the toll the disease was taking on her, but she continued to blog, showcase her stylish looks and provide inspiration to those who followed her journey. How impressive is that? We only get one shot (that we know of.) We all have an expiration date. We need to make every day count. I'm challenging myself to be better, do more, take more risks, discover my true purpose, and live my life in a way that will make me proud when I look back and reflect. I also challenge you to do the same! 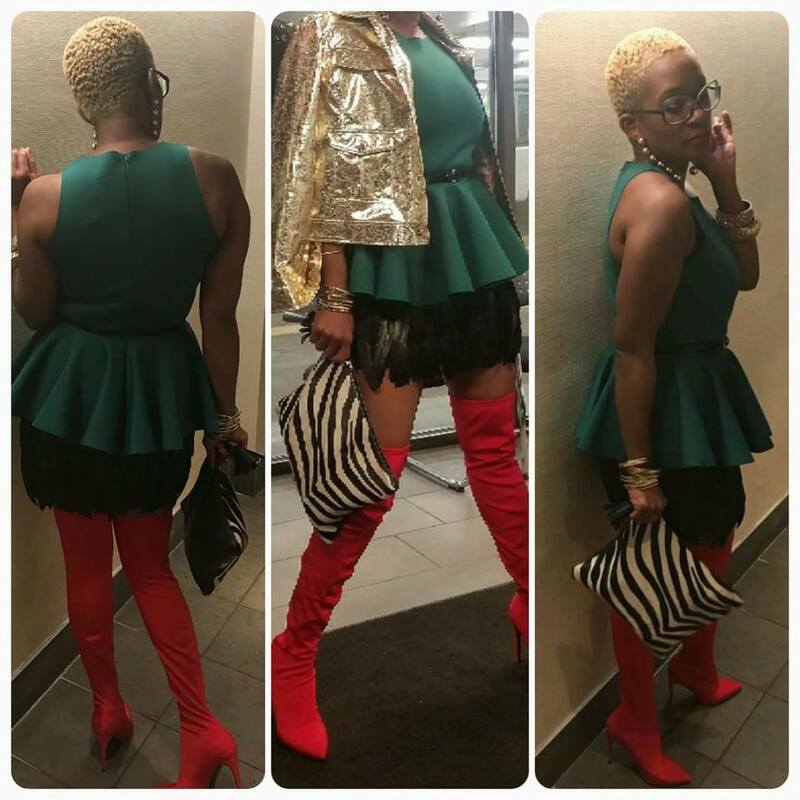 I threw on my green peplum top, red thigh-high boots by Steve Madden and gold faux leather jacket from Boo Hoo. I took it over the top with all of these statement pieces in one outfit. Animal print clutch by Love Cortnie. On my actual birthday, I went to dinner with my family and kept it low key with leggings, a flowy tee, and this cropped white denim jacket - all from Express. My sparkly slouchy boots by Stuart Weitzman completed the look. Thank you for reading and as always - Be Fearless. Stay Fashionable. Have Fun!